One of my friends is finally having a baby after trying for over a year. I wanted her first baby shower to be extra special. I paid close attention to detail and I decorated my house with two different shades of pink with a touch of lime green. I added a little of whimsy with butterflies here and there, helium balloons, streamers, ribbon and tulle. Unfortunately I didn't take pictures of everything! 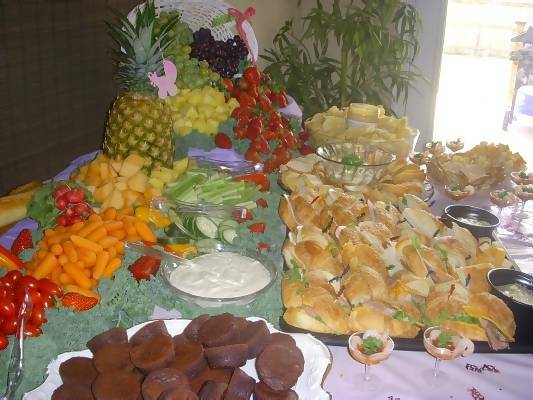 I wanted the food to look professionally displayed, so I looked everywhere online to find a nicely decorated reception table and surprisingly I only found one or two. Perhaps I wasn't wording it right? Anyhow, I managed to do one and hope others will be inspired! I found these little champagne glasses in the wedding section and these were little keepsakes. I filled them with little shrimp and a touch of cocktail sauce. Get it? "Baby" "shrimp," and they are "pink"? I know I'm cheesy, but everyone loved them! I did go a little steep on the cake. I really wanted it to be special and it came out great! I had the cake designer go off the Shower Invitation and they did a fantastic job! It had strawberry filling to go with the theme of pink! =D The cake is from The Cake Shop in San Antonio, TX. I decided to go pretty simple with the diaper cake. I didn't go with adding bottles, rattles, toys or anything like that since I went a little over on the real cake. 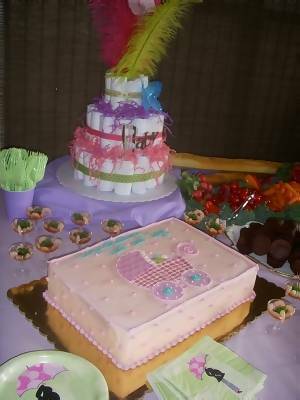 But I thought this diaper cake would add decoration and went well with the theme. I simply decorated it with ribbon and letters found in the scrap booking section. A couple of feathers to add some height and a simple little butterfly that was a different color than the other butterflies I had pinned all around my house. 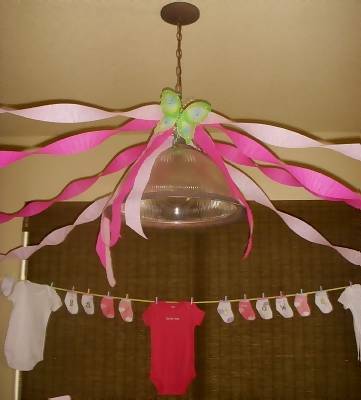 Instead of using a store bought Baby Shower banner, I strung up little socks with a couple of Onesies and used letters I found in the scrap booking section at a arts and crafts store and stuck them on the socks to spell out Baby Shower. I found little clothes pin party favors, they worked great to hang the clothes up. And at the end of the party I had a little basket with the left over clothes and told my friend don't forget her laundry! This site helped me figure out all the little details and inspired me to come up with other ideas! Thank you for all your help! 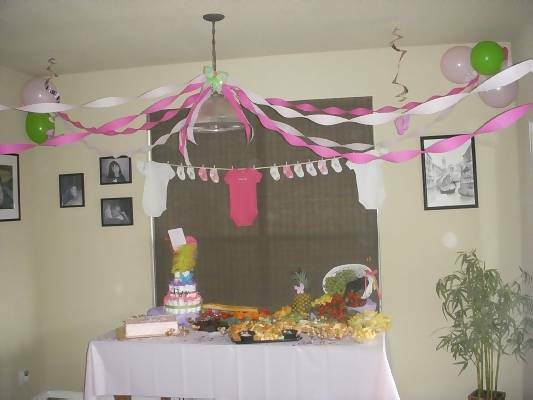 I hope everyone's Baby Shower is just as memorable! You did an excellent job on all of your decorations. Thank you so much for sharing your ideas with others. Your ideas are awesome, and I am now very eager to start planning my daughters shower. Thanks once again.